The writer's notebook is an essential part of your English learning. You will be provided with a notebook to customise OR you can buy your own writing journal. You will be provided time each lesson to write in your journal. You will given prompts to help you with ideas as well as the opportunity to write things of your own choice. You should also spend time re-working your writing into different styles or text-types. 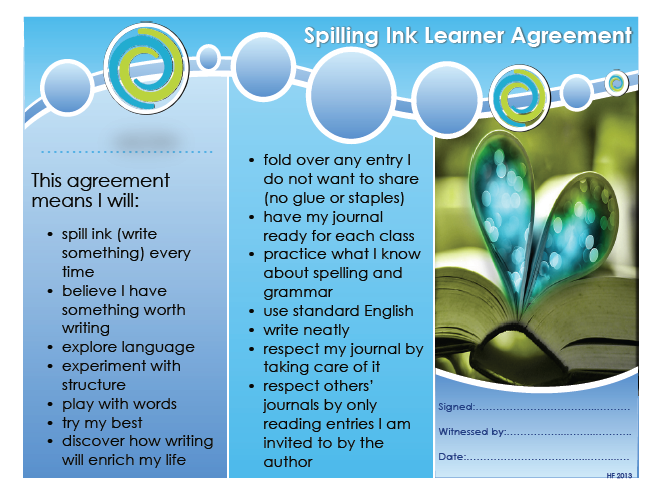 All learners will sign the Spilling Ink Agreement, which will go into the front of their writing journals.